Ironically, that assessment might apply to the murky deal struck for a new arena project at Belmont, with retail, hotel, and office space aimed to open in 2021. While “privately financed” (as media reports stressed) and touted by Governor Andrew Cuomo as a “win-win-win," given the opportunity to activate fallow land, it involves a seeming lowball lease and an unclear public cost to upgrade Long Island Rail Road service. Welcome to sports venue financing in New York, which may not have the blatant giveaways seen elsewhere, but can still help team owners significantly. Madison Square Garden, for example, home to the hockey Rangers and basketball Knicks, recently self-financed a renovation but the owners save $42 million a year in tax exemptions. And builders of three newer venues—Barclays Center, Yankee Stadium, and CitiField—saved hundreds of millions of dollars via a questionable and now-restricted form of financing, known as payments in lieu of taxes (PILOTs). For the National Hockey League’s Islanders, Belmont promises a modern, lasting home in suburbia after decades in the undersized and antiquated Nassau Coliseum, which lacks luxury suites and mass transit access. In 2011, county voters nixed a referendum for a publicly funded replacement arena; the next year, owner Charles Wang, unwilling to leave New York and lose a lucrative local TV contract with MSG Networks, agreed to move to the Barclays Center in Brooklyn. But Barclays, built for basketball and offering poor sight lines for hockey, has failed as “Tradition’s New Home”; the Islanders’ attendance this past season was last in the NHL. The new team owners, Jon Ledecky and Scott Malkin, should be pleased with the planned arena. In 2014—before the Brooklyn move—they bought 85 percent of the Islanders from Wang with the team valued at $485 million. By 2016, after one season as second-class tenants in Brooklyn, the Islanders were valued by Forbes at just $385 million. The only other bidder for the 43 acres of underutilized parking lots at Belmont was New York City FC, aiming to build a stadium for soccer, a sport that hardly rivals hockey in Long Island. But the public doesn’t know how the bids compare, since they’ve been kept under wraps by the Cuomo-controlled ESD, the state’s economic development authority. Nor has any appraisal been disclosed. But it’s known that NYAP, which includes Islanders ownership, Sterling Equities (a real estate firm led by the New York Mets’ owners), Madison Square Garden, and the Oak View Group (an arena development firm partly owned by MSG), offered $40 million upfront to control up to 43 acres over 49 years. Though there’s no direct comparison, consider that the operator of a “racino” on 67 acres at the Aqueduct racetrack in nearby Queens paid about 10 times more per acre. 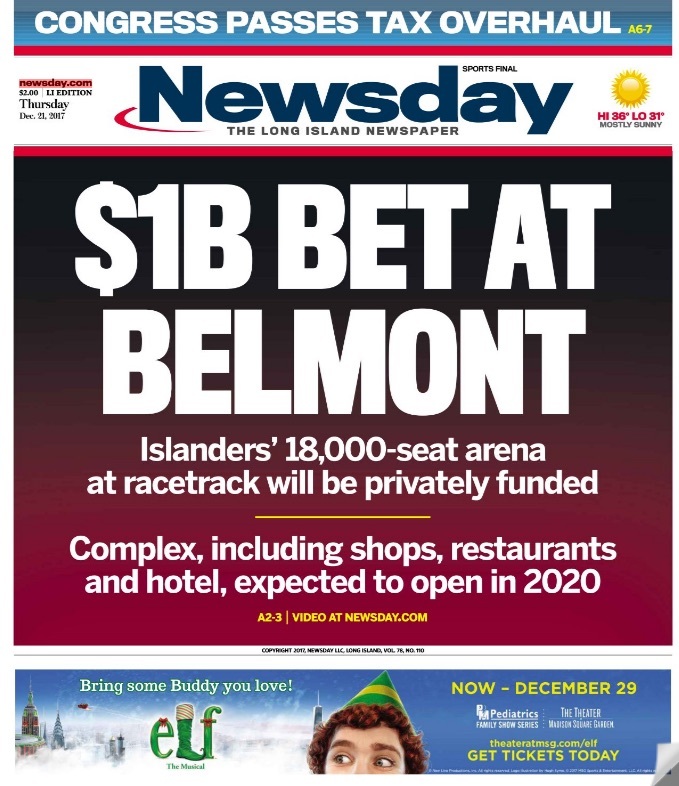 Fans and boosters on Long Island, tribally tied to the Islanders since its inaugural season in 1972, have embraced the Belmont project. But if the arena, projected to host at least 41 hockey games and 150 other events a year, proves successful, it might be at the expense of the team’s original home, the recently renovated and downsized Nassau Coliseum. Just seven miles away, as the crow flies, the 46-year-old venue is owned by the county and operated by BSE Global, which is owned by the Russian oligarch who operates Barclays Center, Mikhail Prokhorov. The deal’s biggest question mark slid into Cuomo’s December press release: “To accommodate New Yorkers and visitors traveling to the brand-new facility, the Long Island Railroad is committed to developing a plan to expand LIRR service to Belmont Park Station for events year-round.” That was hardly an arm’s-length commitment: Cuomo effectively controls the Metropolitan Transportation Authority (MTA), which runs the LIRR. Nor was a price tag attached for a project still under study. The Belmont station sits on a spur off the Hempstead branch, and currently operates on event days only, with heavy service only for the Belmont Stakes horse race. * Crucially, it only serves passengers arriving from the west. Full Belmont service, opening the complex to much of Long Island, would require a second upgrade, which the Village Voice has suggested might be impossible. No wonder watchdog group Reinvent Albany has asked the state to reveal the project’s “full cost to state and local taxpayers, and the value to the businesses building [it].” The state agency's Draft Scope, a first step in the project’s year-long environmental review, promises the study “will include independent estimates of the [project’s] economic benefits.” It’s unclear if it will address costs. Cuomo made it happen. Ensuring that the Islanders will split their time between Brooklyn and Nassau over the next three seasons, the governor offered $6 million of ESD funds to renovate Coliseum locker rooms, install cabling, and other upgrades. Even the Long Island newspaper Newsday—generally supportive of the Islanders’ return and owned by Patrick Dolan, whose family controls MSG—opined that the team and/or arena operator should have paid. The Islanders have experienced their own hockey-related drama in the meantime. After a mediocre season that provoked fans to buy billboards urging General Manager Garth Snow’s departure, team owners recently hired front office legend Lou Lamoriello to head hockey operations; he swiftly fired Snow and head coach Doug Weight. The team will pick 11th and 12th overall in next week’s Entry Draft and will try to re-sign star center John Tavares, the league’s top free agent. For now, an awkward relationship continues with Barclays, which, when controlled by arena developer Bruce Ratner, agreed to guarantee a payment to the Islanders in exchange for running the business operations. “They were like a rent-a-team,” Barclays Center CEO Brett Yormark told an interviewer in February. "This team never really embraced Brooklyn, unfortunately.” Yormark, arena CEO from the start, immediately faced pushback regarding Barclays policies that alienated hockey fans, including restricting ticket-holders from watching warmups, introducing a new goal horn, and encouraging those in obstructed-view seats to consult their phones. Cuomo, who counted the Belmont arena announcement among his numerous 2018 State of the State proposals, has faced little downside. His publicity bump—“Thank you, Governor Cuomo,” read Dowd’s sign—offers momentum for a third term and a potential higher profile nationally. The local arena opposition has been vocal but small, using the creative hashtag, #TIMBY (Transparency in My Backyard). They recently seized on the abysmal performance of the Long Island Rail Road during the Belmont Stakes on June 9, wherein 20,000 racegoers—albeit far more than would take the train to a 19,000-seat arena—were stalled for at least an hour because of signal problems. Taxpayer support for the LIRR’s Belmont upgrade has not become a major issue, given the lack of clarity. It’s a good bet that the ever-savvy Cuomo will keep any alarming price tag from surfacing until after the election. Correction: A previous version of the story incorrectly stated that the Belmont Park LIRR station only operates one day a year. It is open for event days.